The Detroit Metropolitan Bar Association has ranked three incumbent judges seeking re-election or higher office as “not qualified” in the DMBA’s judicial ratings for the Aug. 7 election. Wayne County Circuit Judge Richard Halloran Jr. The Michigan Supreme Court has disciplined Halloran twice since 2002. In In re Halloran, 466 Mich. 1219 (2002), Halloran consented to a public censure by the MSC and a 90-day suspension without pay. Halloran admitted or did not contest findings by the Michigan Judicial Tenure Commission concerning an incident in a public restroom with an undercover officer. In In re Halloran, 486 Mich. 1054 (2010), Halloran agreed to a public censure and a 14-day suspension without pay, Halloran dismissed 30 family law cases, which he failed to timely adjudicate, to avoid an administrative reporting requirement that would have revealed he missed deadlines to complete the cases. Inkster District Court Judge Sylvia James. The Michigan Supreme Court recently heard charges issued by the Judicial Tenure Commission against James. The JTC has alleged James misused funds from the court’s Community Service Program account and made misrepresentations to the JTC and the special master appointed to conduct an administrative hearing on the matter. Update Aug. 1, 2012: The Michigan Supreme Court issued an opinion on July 31, in which James was removed from the bench. See In re James. Dearborn District Judge Mark Somers. Sommers was hit with two jury awards last year totaling more than $1 million in favor of female court workers. The juries agreed that in one case, Somers wrongfully eliminated her position and in another, wrongfully discharged her. The DMBA’s complete rankings are available here. Remember the so-called “back room deal” in which former Justice Elizabeth Weaver retired months before the 2010 election? According to accusations at the time, the “deal” was struck so that then-Governor Jennifer Granholm could appoint a Democrat supported replacement to be an “incumbent” on the November ballot. State Republicans were apoplectic about the deal at the time and, as you can see from the above line, rejoiced when the “coup” failed and Mary Beth Kelly was elected to Weaver’s seat that November. Welp, such back room deals aren’t limited to Democrats, apparently. Kent County Prosecutor William Forsyth accused State House Speaker Jase Bolger (R – Marshall) of conspiring with Rep. Roy Schmidt to switch parties and rig Schmidt’s 2012 reelection campaign by handpicking a severely underqualified 22 year-old as his Democratic opposition. 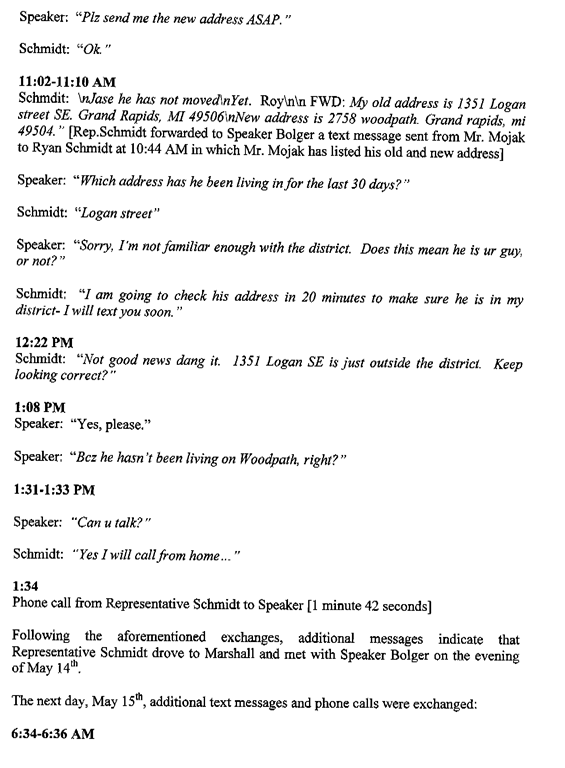 According to the report obtained from The Detroit News’s website, Bolger convinced Schmidt to jump from the Democratic Party to the Republican Party. But the two agreed that in order to secure reelection, they needed to ensure that no established Democratic candidate opposed Schmidt this November. Schmidt offered $450 to his son’s friend, Matthew Mojzak, a 22 year-old clerk at a GNC store, to put his name on the ballot as a Democrat to run in the election. 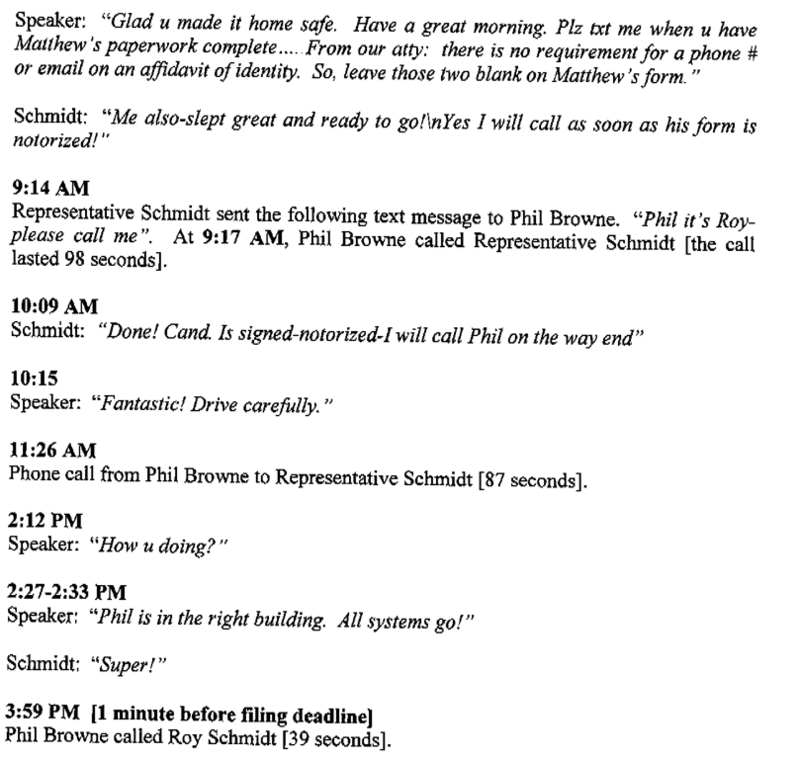 The report says that Schmidt then took the affidavit and a money order Mojzak purchased to Bolger’s office and gave it to Bolger’s deputy chief of staff, Phil Browne. Browne filed the paperwork and paid the fee to get Mojzak’s name on the ballot. Within minutes of Browne filing the papers, Schmidt withdrew his Democratic Affidavit of Identity that he had filed in February and filed the appropriate papers to have him placed on the the ballot as a Republican candidate. 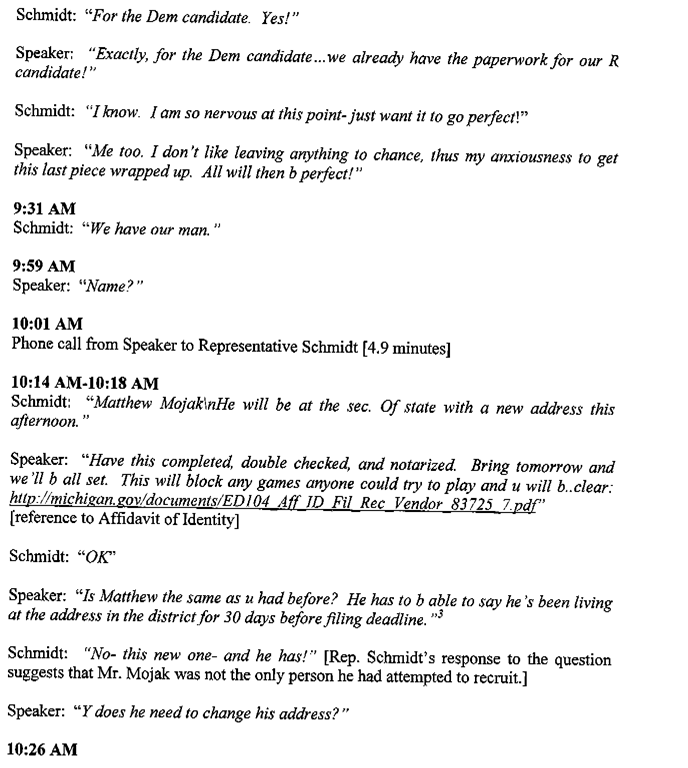 Flabbergasted Democrats hustled to mount a write-in campaign to oppose Schmidt but soon learned that a 22-year-old fellow that no one in the party ever heard of was all set to go as a Democratic write-in candidate. After Schmidt’s switch, the media looked into Mojzak’s candidacy and found that he wasn’t a qualified elector and couldn’t run for office in Schmidt’s district because he hadn’t lived there for 30 days before the filing deadline. Whether anyone other than Rep. Schmidt and Speaker Bolger was involved in this plan is irrelevant in the context of a criminal investigation; it was not illegal. Incredibly, while it would be illegal to pay a boxer to take a “dive” or a basketball player to “point-shave”, it is not currently a crime in Michigan to recruit someone to run for public office, place them on the ballot at the “eleventh hour” and essentially pay them to make no effort to win. Schmidt isn’t talking. Bolger told the Detroit Free Press he didn’t know money was involved. He has no plans to resign. Political people in and out of Lansing aren’t amused. Dennis Lennox, a Republican political operative from Traverse City, called on Bolger to relinquish the leadership role. “This is a distraction, it shouldn’t be a distraction and the speaker should do the right thing and resign as speaker,” Lennox said. Bill Ballenger, publisher of Inside Michigan Politics, said Bolger may be able to defend his actions when House Republicans meet today in Lansing, describing it as an attempt to bolster the GOP’s 64-46 majority. “He was looking out for their best interest, he got a party convert, but he was inept and clumsy the way he went about it,” Ballenger said. Landfills smell sweet compared to this. NOTE: Ed Wesoloski and Brian Frasier collaborated on this report. A divided Michigan Supreme Court has upheld 2011 PA 280, which limits county commissions to 21 members in counties with 50,000 or more residents. In addition, in counties with more than 1 million residents, the act reassigns apportionment duties from county reapportionment commissions to the board of commissioners. Counties not in compliance with the act have 30 days to adopt a conforming apportionment plan. What’s the practical effect of all of this? It’s an enormous gift to Oakland County Republicans, according to the legislation’s critics. As the act is written, Oakland County is the only county that will have to redraw its election maps right now. And because the county has more than 1 million residents, Oakland’s reapportionment commission, where Democrats have a 3-2 edge, gets cut out of the picture, and the Republican-controlled county commission is now in the driver’s seat. Earlier this month, the Michigan Court of Appeals sided with the plaintiffs in Houston, et al. v. Governor, et al. (majority opinion) (concurring/dissenting opinion), and ruled that the act was unconstitutional. The COA majority reasoned that because the act affected Oakland County only, it was a local act that required a two-thirds vote by the Legislature. The act is invalid because didn’t muster the required number of votes under the state constitution, the COA majority ruled. Defendants, Gov. Rick Snyder and the Oakland County Board of Commissioners asked the MSC to grant leave to appeal. The MSC heard oral arguments on an expedited basis. Plaintiffs, in defending the COA’s ruling, hammered on two points: first, the act’s effects resulted from an exercise of raw political power, and second, the COA got it right — the act is a local act because it affects Oakland County only. Late yesterday, in a 4-3 order, the MSC majority responded “so what” to the first point and “reversed” to the second point. Plaintiffs make much of the alleged political motivations behind the Act, calling it a “political favor” to the Oakland County Executive and citing numerous supportive editorial comments. As with any redistricting of political maps, the parties here vie to create maps that benefit their own interests, and a dispute with partisan implications has not surprisingly arisen. Notwithstanding this reality, “[t]he validity of legislation can never be made to depend on the motives which have secured its adoption, whether these be public or personal, honest or corrupt.” Cooley, Constitutional Law, p 154. In reaching our decision, this Court, as it is always, is engaged in applying the equal rule of law to the best of its ability. That there may be some partisan advantage to one side or another in this decision is simply a function of the fact that there is no conceivable decision that could have been reached in which one side or the other could not have asserted that partisan advantage accrued to the other. We believe that a fair review of the decisions of this Court in which some partisan advantage was at issue would make clear that our decisions have been marked by a commitment to a faithful reading of the law. As to the merits, the majority looked to the two-part test in Dearborn v. Board of Supervisors, 275 Mich. 151 (1936), for determining whether an act is local or general. 2011 PA 280 satisfies the Dearborn test. First, the limiting criteria are reasonably related to the overall purpose of the Act. Here, the overall purpose is to limit the number of districts a county may apportion, and the population criteria set forth in the Act seem a reasonable means of achieving that purpose. Second, the Act is open-ended. It provides various population ranges and places corresponding limits on the number of districts for every county within those ranges. As a county’s population increases above or below a given range, the number of districts that may be apportioned by that county will increase or decrease respectively. Absent a transitional period during which some counties must necessarily be treated differently from others, it would be impossible for the Legislature to make general, uniform changes to public policy pertaining to local government. That is, to bring counties that are out of compliance with the Legislature’s preferred public policy into compliance, and to establish uniform policy, those counties out of compliance must be treated differently during the transition or else uniformity can never be achieved. The transitional provision here accomplishes just such a purpose by ensuring that Oakland County will not be the only county that operates outside of the apportionment limits of the Act until the next census. Justice Marilyn Kelly, joined by Justice Michael Kelly, dissented. Justice Diane Hathaway, in a separate dissent, agreed with Kelly’s dissent. The act’s effective date is March 28. The political cartographers in Oakland County are sharpening their pencils in anticipation.